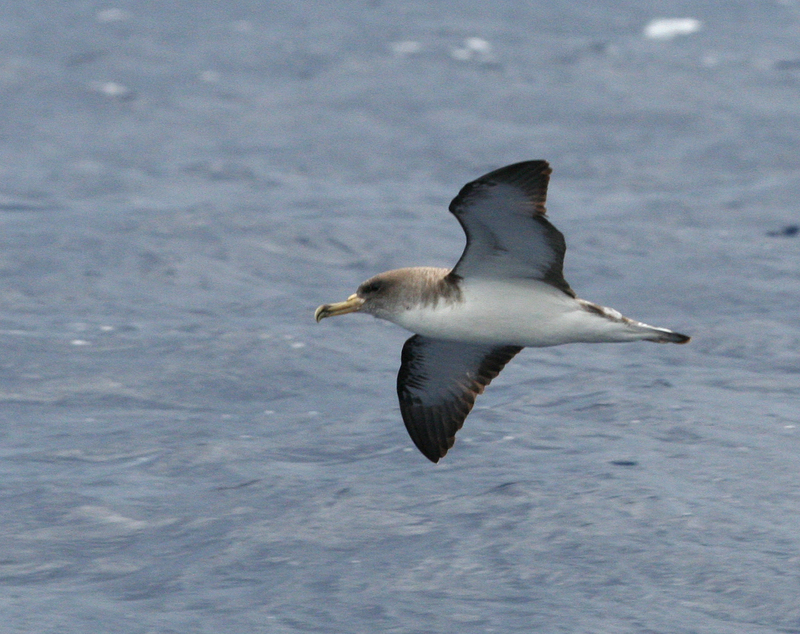 The commonest pelagic seabird was the Cory’s Shearwater which breeds in large numbers in the islands. 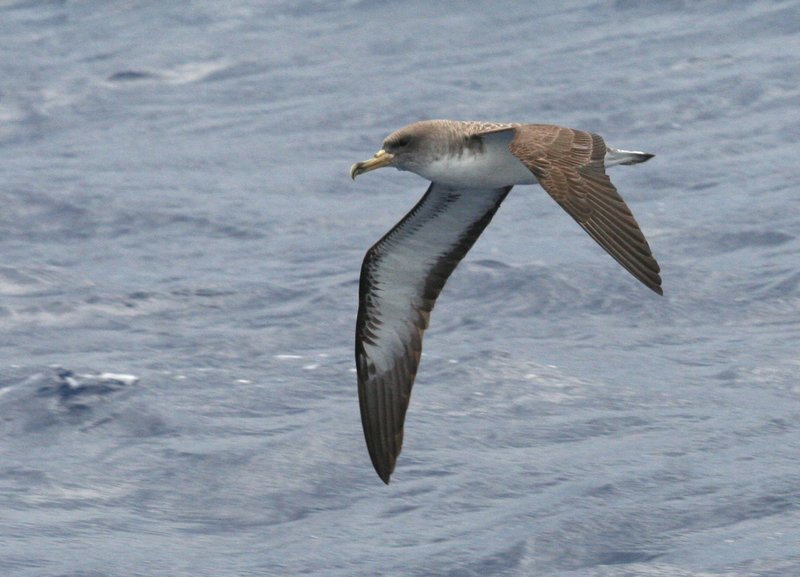 The species has recently been split into three; the smaller Cape Verde Shearwater Calonectris edwardsii, Scopoli’s Shearwater C diomeda whose breeding is almost confined to the Mediterranean (but winters off South Africa so must traverse the Atlantic) and Cory’s Shearwater C borealis which breeds only in the Azores, Madeira, Canary and related islands. 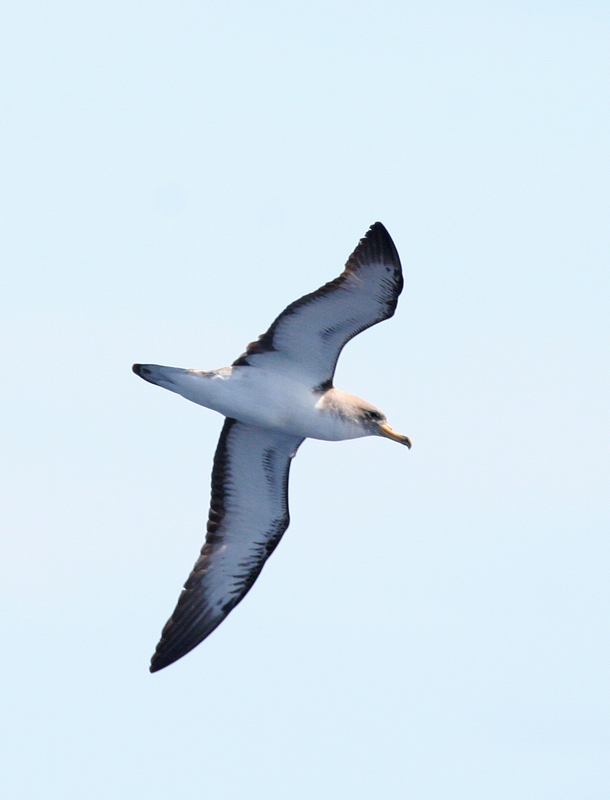 One of the largest of shearwaters, Cory’s is easy to separate from Great, but telling it from a Scopoli’s on the pattern of white in the outer underwing would require a photo. The further out to sea we got the scarcer Cory’s and the commoner Great Shearwaters became. 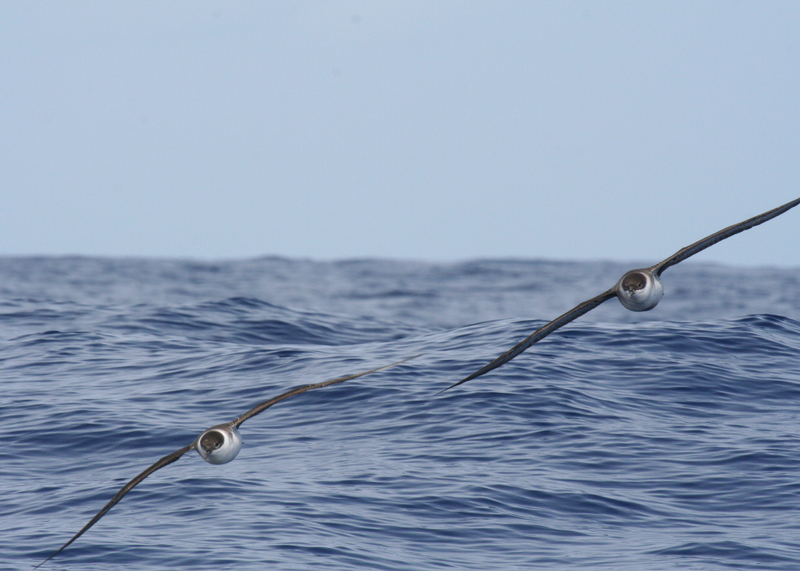 Great Shearwaters breed in the Tristan da Cunha group in the south Atlantic. After breeding they undergo a tremendous loop migration that takes them north to the Grand Banks off America and then south through the eastern Atlantic in our autumn. Sooty Shearwaters also breed in the Southern Atlantic and around Australia and New Zealand. 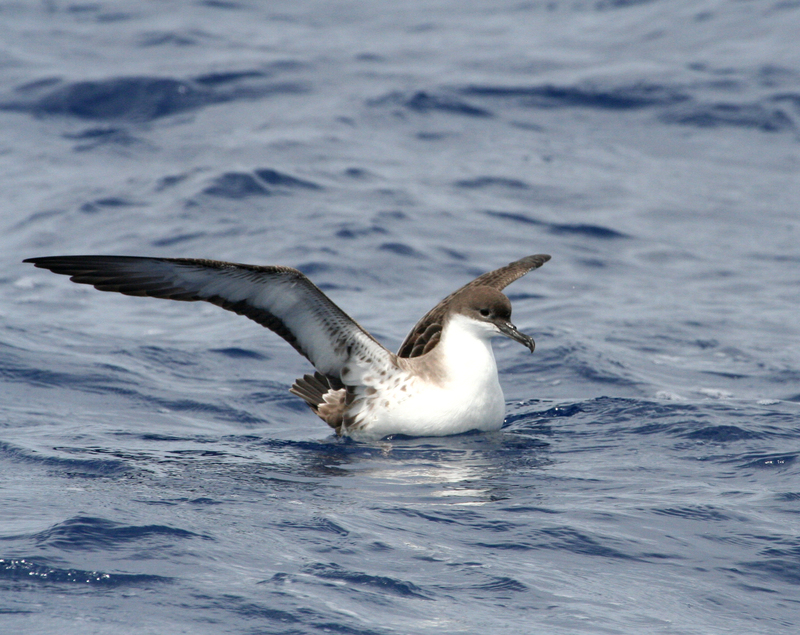 Atlantic populations undergo a loop migration like Great Shearwaters although they peak in the eastern Atlantic a bit later in the autumn. 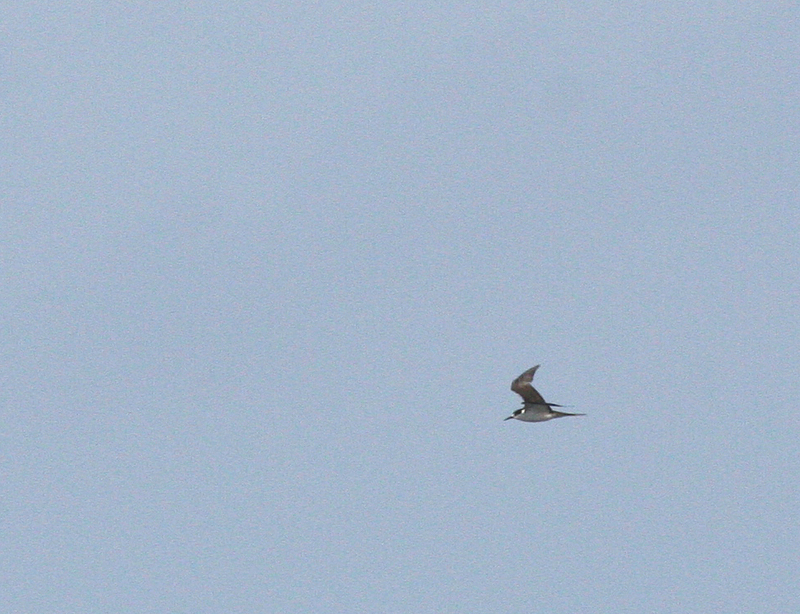 The other tw shearwaters, Manx and Barolo’s were too distant or briefly seen to be photographed. 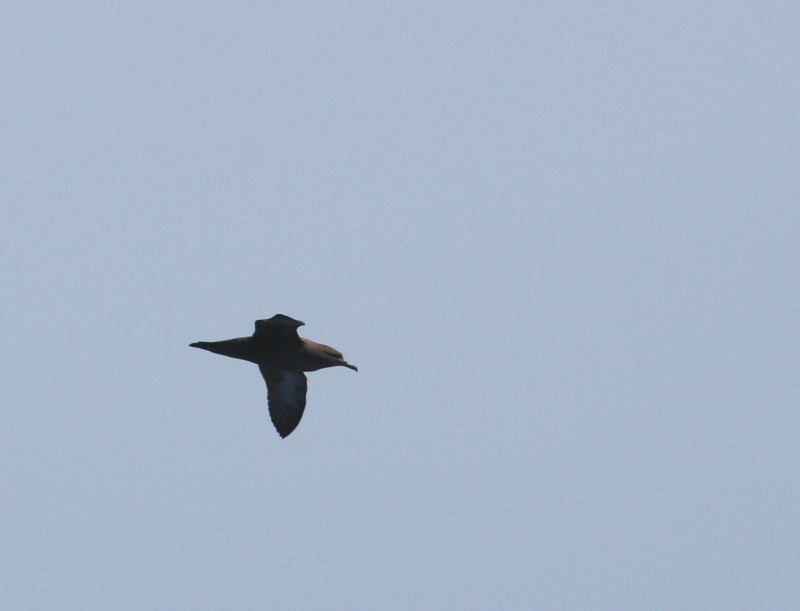 … and this bird which we assumed was a 2nd cy Great Skua (or Bonxie) from its moult pattern. South Polar Skua is another possibility, as like the large shearwaters it undergoes an Atlantic loop migration. 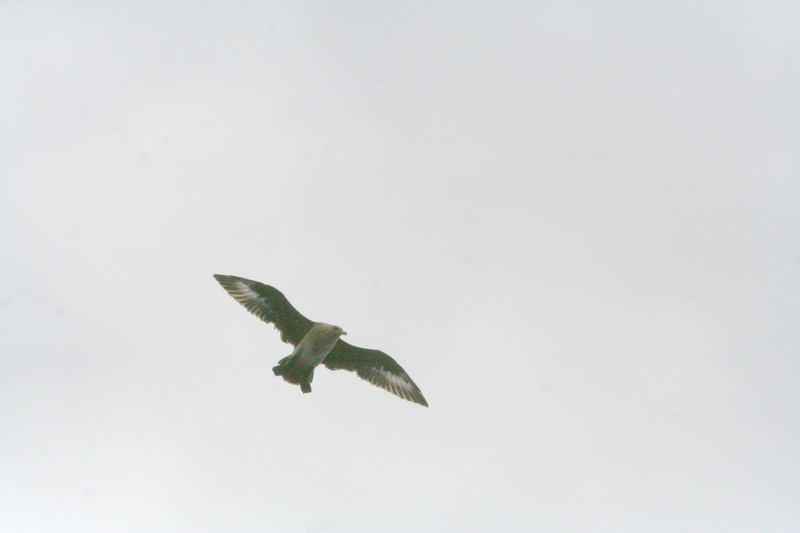 If you can identify this bird conclusively either way then please leave a message. Postscript: Dani Lopez-Velasco, who wrote a paper on the identification of South Polar Skua has conclusively identified it as a South Polar. 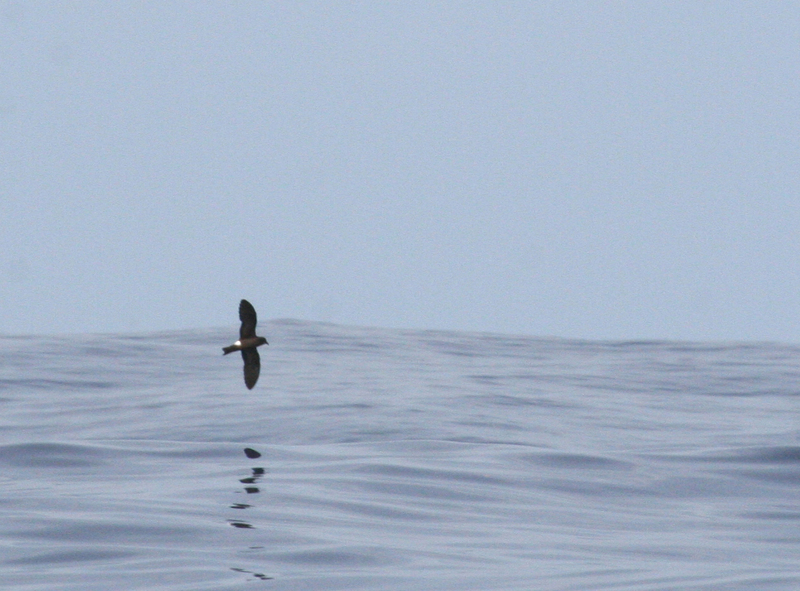 Far smaller than the shearwaters but larger than storm petrels, the little Bulwer’s Petrel was a wonderful sight. I saw seven during the trip. 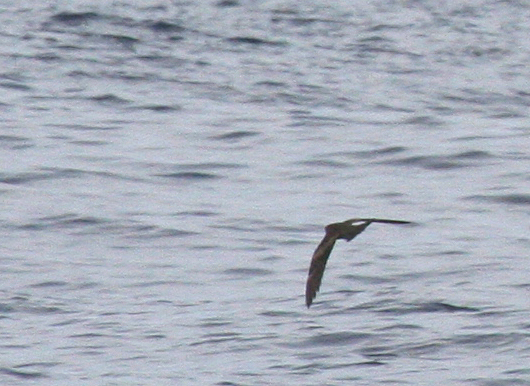 The highlight the trip was the great views we got of four species of storm petrel. Our friend, Magnus Robb, wrote a wonderful book on the seabirds of the north Atlantic (Petrels Night and Day – The Sound Approach) and based mainly on vocalisations split ‘band-rumped storm petrel’ into four species. The form breeding on two islets off Graciosa, was already being described as Monteiro’s SP (photo above), it breeds in the summer whilst the other population, called Grant’s Storm Petrel (after the late and much missed birding guru Peter Grant) breeds in the winter. Grant’s is not confined to the Azores but also breeds (in winter) in the Canaries and Madeira and associated islands where it occurs with a third form, Madeiran Storm Petrel (that breeds in the summer). The fourth form breeds only in the Cape Verde Islands. Monteiro’s is treated as a full species by the world’s checklists but Grant’s is not recognised at all. All forms are vocally distinct and to some extent, genetically distinct. Thus we have a summer and winter breeding population in the Azores that are treated as two species and a summer and winter breeding population in the Canaries and Madeira that are treated as the same species. Something needs to change! At this time of year Monteiro’s is ending its breeding cycle and is starting to moult and this can be clearly seen as a notch in the wing where the new, still growing inner primaries abut the old faded outer primaries. On some it was striking and could even be seen with naked eye. Another advantage of visiting in August is that this year’s juveniles will still be in the nest, so there is no confusion with recently fledged individuals with fresh flight feathers. Also Monteiro’s shows a clear notch in the tail, whereas Grant’s does not. I am confident this is a Grant’s Storm Petrel with fresh flight feathers with no evidence of moult and a square ended tail. But some birds seem intermediate – the secondaries on this bird look fresh and contrast with the primaries, but there is no evidence of moult. Do Grant’s look like this post moult? There is a small tail fork but not as obvious as on the Monteiro’s. Is this another Grant’s? The same can be said about this bird, is the apparent tail fork caused by the feet showing below the tail and is that a notch in the wing caused by moult or just the way the wing is bent? I think it’s a Grant’s but I’d appreciate informed comments. 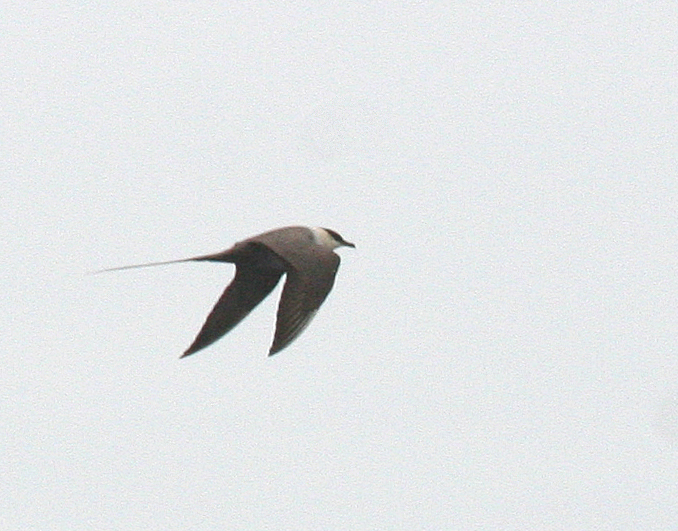 The best bird of the trip, was another species of storm petrel, the legendary Swinhoe’s. Breeding off Japan and Korea and wintering in the Indian Ocean, hardly surprisingly the only historic WP record was from Eilat, but in the 80s there was as series of captures by ringers at storm petrel colonies in Madeira, the Canaries, France and even the UK. They must be breeding somewhere in the north Atlantic! Since then there have been several more captures in the UK (including the last two years on Fair Isle) but the bird remains extremely hard to catch up with. As one of my goals is to see every bird on the British list somewhere in the world (now just four to go, Ascension Frigatebird, Aleutian Tern, Tufted Puffin and Red-throated Thrush) then seeing a Swinhoe’s had become a high priority. 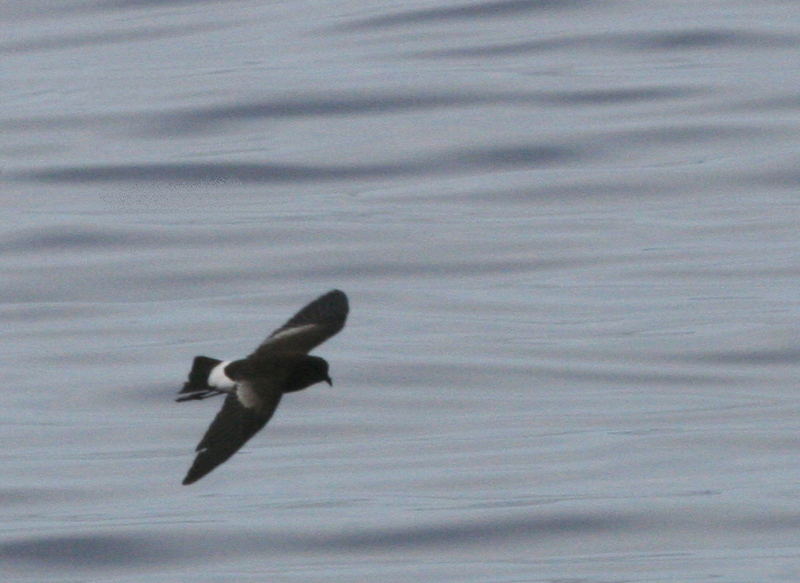 A third white-rumped species was Wilson’s Storm Petrel which breeds in Antarctica and also undergoes a loop migration, appearing in the eastern Atlantic in late summer. As well as being smaller with longer legs, a more curved wing shape and a more fluttery flight they can be distinguished by their moult pattern, at this time of year they have moulted all the primaries except the outer one or two. This bird seems to have replaced all its primaries in the left wing but is still growing the outermost primaries in the right wing. 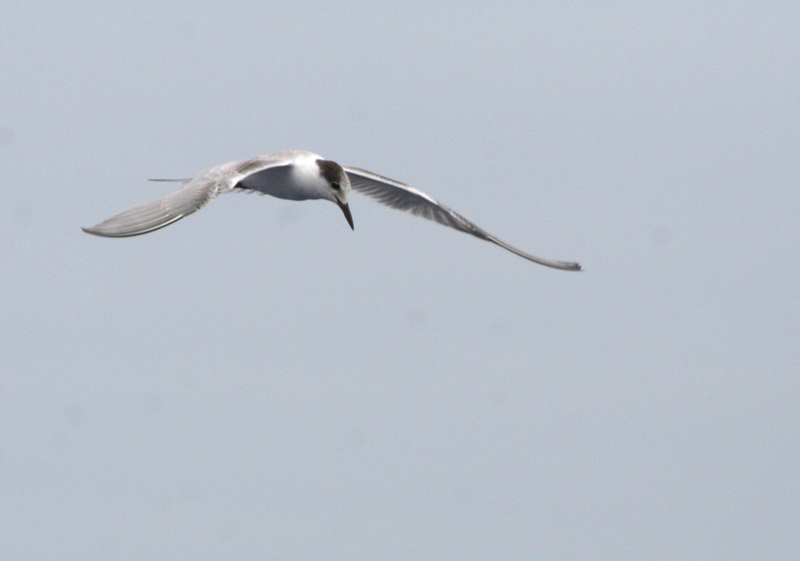 Common Terns lived up to their name but in spite of the Azores holding the WP’s largest population of Roseate Terns, they were surprisingly scarce, with the only sizable flock being seen briefly on the Teceira breakwater as we departed on the ferry. Ilheu da Praia, a tiny islet off the NE of Graciosa not only holds almost the entire world’s population of Monteiro’s Storm Petrel but also the WP’s only breeding Sooty Terns. On the day we visited the sea was rough and we couldn’t come any closer to the island. However the single juvenile did briefly buzz the boat on a couple of occasions. 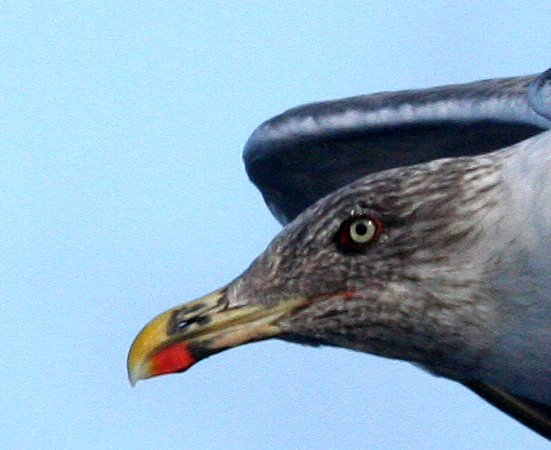 The atlantis race of Yellow-legged Gull is a very impressive bird indeed. The heavily streaked hood and pale eye are distinctive. I have heard that a paper is in preparation which advocates its elevation to species status. Intermediate populations in the Canaries and Madeira are the problem with this approach however. I said this post was only about seabirds but I couldn’t resist including a couple of photos of Bottle-nosed Dolphins. We also saw Atlantic Spotted Dolphins, a Sperm Whale and the beaked whales that I uploaded on the last post.